After almost a good fortnight of rains in Tamil Nadu the current spell is now on its way to logical conclusion as the last couple of days have seen a much quieter thunderstorm activity over Tamil Nadu. If Sunday saw thunderstorms limited to a few districts along NH 45 from Villupuram to Madurai yesterday saw even more restricted activity in Tamil Nadu as the rain bands shifted slightly to the west giving some isolated rains over parts of Rayalaseema & South Interior Karnataka region. One or two places in the Northwest Interior Tamil Nadu adjoining these regions got some rains but overall it was a fairly quite day for much of Tamil Nadu. With the wind confluence at about 0.9 kms above mean sea level currently prevailing further west to the locations of impact last week we are seeing the rain bands also move slightly to the west with more streamlined Easterlies prevailing over major part of Tamil Nadu. These streamlined Easterlies would also be playing a role in modulating the day time temperatures over the state particularly along the coast keeping it more moderate. 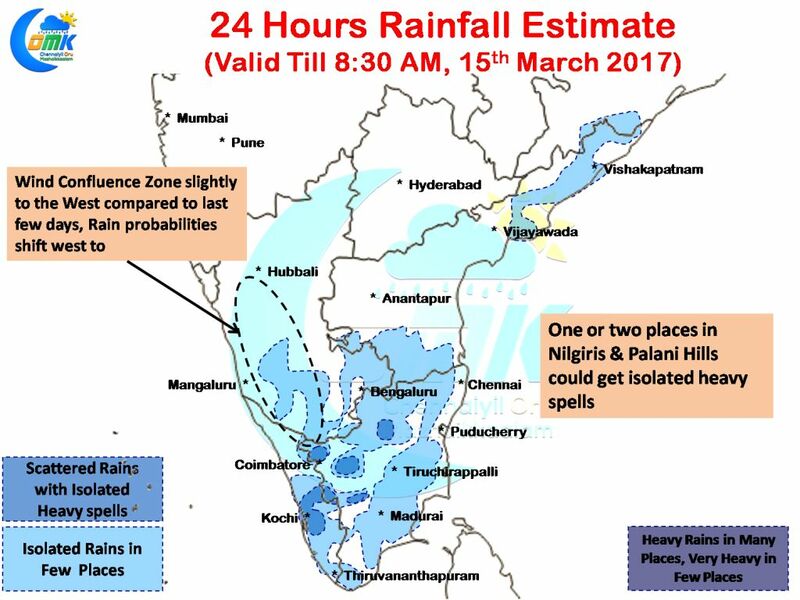 As far as Rains in Tamil Nadu go we can expect another fairly quite day with isolated heavy spells over the Palani & Nilgiris high ranges likely in one or two places. One or two places in West Tamil Nadu around Salem / Dharmapuri and the adjoining parts of Karnataka near MM Hills / Kollegal could see some moderate to heavy spells late in the evening. The transition to dry phase has started and in the next couple of days we will start seeing more drier weather prevail over major part of Peninsular India except possibly the lower latitudes of West Coast in Kerala.